Aluminum rain gutters have been in use for a long time now but they retain their durability, serving their purpose perfectly and at the same time, adding a strong and vintage look to your home. If you feel aluminum gutters obstruct the appearance of your home, think again. At San Antonio Rain Gutter Pros, we have been installing aluminum gutters in homes for years. In our experience, rain gutters made from aluminum look great and last the longest. You are also bound to appreciate the classic look they will add to your home, while at the same time keeping it safe from seepage. As a homeowner, you will surely realize the impact rainwater can have on the condition of your home. The excess water which gathers on your roof can seep in to the walls, causing a moisture buildup, which then causes molding and other issues. Moreover, the water leaks from the roof to the ground. If you have a lawn, the dirty water can cause the soil to erode and your lawn will lose its look in no time. Therefore, installing sturdy rain gutters is important to keep your home and the soil around it safe from erosion and other forms of damage. This is where San Antonio Rain Gutter Pros can help you. What you have to realize is the fact that simply opting for aluminum gutters won’t get the job done. You have to make sure the gutters are installed properly otherwise they might not serve their purpose and your investment will go down the drain. We have a team of rain gutter installation and maintenance professionals who can help you select the right aluminum gutters for your home, according to your needs and preferences. This way, you can rest assured you will get a top quality product that will last you for many years to come. In addition to the damage rain water can cause to your home, there is the visual aspect of it. Over time, the water draining off the roof can lead to ugly trenches forming around your home, which has a negative impact on anyone who visits your home. It could affect the curb appeal of your home in a negative way and even cause its value to deteriorate. Moreover, if the water seeps into the walls, it could lead to brown spots forming, and if molding occurs, your walls could be covered in green. This would require a paint job. With aluminum gutters, the water which gathers on your roof is drained into the gutters and then directed to an absorption patch below, causing no damage. The only cost you bear is buying the gutters and having them installed and maintained. 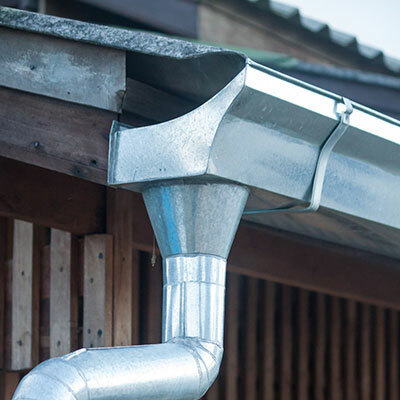 At San Antonio Rain Gutter Pros, we can help you throughout the process, ensuring you get the best aluminum gutters in San Antonio and then keeping them in top shape to ensure they last you for a long time, so that you get the best value for your money.